74% of the ball but nothing to show for it: While Swansea may be the artists, the science of Stoke triumphed in a game that more resembled the staccato of rugby or American Football than a free flowing contest. The fact that ball possession for the Swans was 74% (from whoscored.com) but overall possession (from BBC figures) was 51% suggests that an awful lot of the time, Stoke were technically in possession but not actually with the ball and I’m sure plenty of this time the ball was wrapped in a towel. People might call it hoofball or anti-football, but it was certainly effective, the Stoke crowd sang ‘We only score from throw-in’s’ with a crazed zeal that makes me think they enjoy being perceived as the proverbial bully on the beach kicking sand in the faces of the wimps. Stoke came in to the game being the Premier League team with the fewest shots per game (10) with Swansea the second lowest on 12. Stoke’s approach however means that they might not get many shots but they do create plenty of skirmishes, which when they result in a shot often result in a goal. This was the case in this game with 2 goals from 2 efforts on target. 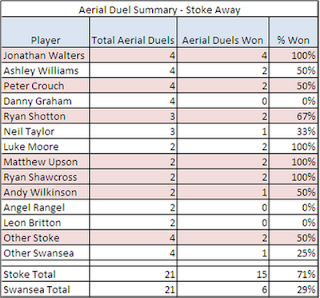 The game also pitched the team with the highest number of aerial duels won per game with the team that had won the least and this continued with Stoke winning 71% of the aerial duels, with Walters winning all 4 of his duels. 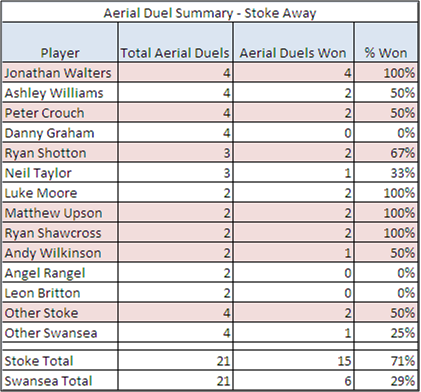 Graham lost all 4 of his and has only won 18 of 72 (25%) aerial duels this season in the Premier League. The substitutions of Dyer and Sinclair were met with cries of ‘You don’t know what you’re doing’ from the Stoke supporters, presumably because Dyer had looked one of our biggest threats but that is now 15 games Dyer has been substituted in out of 22 starts. Part of the problem for the wingers was the lack of space on the pitch in general as can be seen from the image below showing the different pitch size markings with the pitch size for this game markedly reduced both in terms of length and width, enabling Stoke to just sit on the edge of the box and watch the ball get played from side to side in front of them. Credit must be given to Luke Moore who looked lively when he came on, willing to take a more direct approach but I thought given the amount of possession we had it would have it would have made more sense to bring McEachan on for Britton and leave at least one of Dyer/Sinclair on because of their quick footwork in tight spaces. This is the first time this season that Swansea have lost two premier league games in a row but the important thing to not start getting worried and talking about Wigan as a ‘Must Win’ game. It offers a huge opportunity but regardless of the next few results people need to hold their nerve.